for someone with a gambling addiction i say BRING IT ON! Judging from the text this will most likely contain an item from the BMAH that is totally random? Hopefully this will have some sort of class-specific logic to it. I wouldn't be thrilled if my paladin tank got some cloth pvp pants! How much will it go for: More gold than you can afford. Edit: Thankfully, only contains items, no gold! It seems like the only items I ever see on the BMAH anymore are T-1 bracers, random cat carriers, and Blood-Soaked Invitations The first two never made any sense to me, but if they've been building up to this, then Blizzard must be some evil geniuses. Because that is some novel trash that everyone will likely come to hate. I wonder how many of these will contain Blood-Soaked Invitation since that seems to be the most common BMAH item. What this basically means, is that your outright gambling, not as a potential reward, like in LFR or Scenario loot, but as physical (game) money invested on the off-chance that you may get something you like. Depending on the price, and if you are an enchanter.. these seem like a bad lottery ticket to me. Think about all the cheap pets, all the non-spec gear, and all the low level gear that shows up on the BMAH. This has a whiff of Gheed's doing about it. Oooh, this seems super interesting. Time to start saving! Although I have a feeling that what I'll get from these would probably be something I already have... wouldn't be unlike me. Anything can be inside the box! Could be gear, pets, mounts, or Brawler's Guild Invitations! I would be quite annoyed if it were a mount that I already have. If people havent realized it, this will most likely be your best chance at the super rare BMAH items such as: Mimirons head, invincible, and I have no reason to believe that Corrupted Ashbringer couldn't come from the boxes. Why can't I quit you, Gheed? Why can't I quit you? An item sold at a previous auction that was never picked up by the winning bidder. Buyer beware. How much gold does it cost? This item was added to the game in 5.3, and can contain any item from the BMAH. This includes the mounts, pets and other items available. The loot is not currently class specific. so far- it's very much random. In addition to this, you can also get stuff you already have, mounts for example. Frustrating, to say the least. Currently they are not Bind on Account and the loot is bound to the character that you bought the Container on. bad bad math for gamblers. Let´s just say they are nice and do not include the brawler´s guild thing. You still have a ton of non-class ilvl 88 gear from vanilla. You still have a ton of 480ish pvp gear, almost all of which are off-class... you have a ton of ´bunnies´ and other common pets. You have a ton of tournament pets, which would be break even at best. we will see in a few weeks when the stats start pouring in.. but this is a very bad lottery ticket. It's a mystery box Lois, it could be anything. It could even be a boat. Purchased one of these today (5/23) for 22k. I am a troll hunter. (This means horde.) I received the Tyrannical Gladiator's Cloak of Alacrity. Str/Stam etc etc. FOR ALLIANCE. This is basically an FYI that there is a rather large chance of you getting something completely worthless/unusable to you. There is all the tier 3 that most likely wont be for your class/armor type, theres tons of PVP and varying ilevels of heroic gear that probably won't be for your class, etc etc. So for those of you who think you're getting invincible on your first box, you never know, but it's HIGHLY unlikely given the sheer number of items/pets/tcg random stuff that appears on the BMAH besides mounts. Anyway, good luck to everyone who purchases one of these. That was my 22k towards science. Bidding on it right now on skywall, less than 30 minutes left, if i win ill post whats inside. As much as I love the family guy quotes, I find myself thinking of Se7en. As it states "Unclaimed Black Market Containers are now available on the Black Market Auction House. What's inside? It's a mystery! When opened, the container has a chance to contain any item that can be available on the BMAH." Is it possible to get an Unclaimed Black Market Container from an Unclaimed Black Market Container? Thought i would chime in my 2 cents on this, as it seems quite a few people are misreading the item tooltip. The box can contain ANYTHING that is sold on the BMAH, not what is up there the previous week or what not. Every item that is in the BMAH database has a chance to come from the box. The box can contain Mimiron's Head, to any type or PvP gear, to Tier 3 and more. The box is a gamble, and 9 times out of 10 you will get something useless from it. But on the 10th time you might get lucky and receive a really rare mount for 20-30k. Got 센진 우상 from it. Funny thing is, there were only 2 items on the BMAH that day: this container and precisely another 센진 우상. Talk about a coincidence (I wouldn't assume this happens often)! Cost me 70k. Im a Warlock. Shortly after opening I submitted a ticket. Im happy about the whole buyer beware thing and getting junk is expected. At least on Storage Wars they get to look inside before they get punked. This box 'should' open and provide class specific items. I am afraid that this isnt something that we can help with Firlox, as its intended that these items are bound and can contain anything available on the BMAH. As noted in the items tooltip these are purchased entirely at the owners risk, and we cannot refund or exchange ones purchased in regret. Just got 신념의 로브 from box on Arygos (5/25/2013) 30k... not well spent. I have a feeling this will become the 수수께끼의 행운 카드 of Mists, only a WAY bigger gold sink. I still can't help trying it once though. Ill report back with my findings. Figures I actually get a mount to pop up and it's one of the ones I have. I purchased one of these on 5/25/2013 and received 압제적인 검투사의 잔혹 반지 I am a dk and have no use for this. A list of other datamined recipes, some of which are trainable from in-game NPCs, can be found here. Credit to Wowpedia, WoWwiki and Wowhead. Edited to include a few more links to outside sources. I just bought one for 19k and i got 도안: 살인자의 장갑. Not the best but at least I can send it to my LW and in theory I can make my money back and maybe even more. Im still never paying over 10k for a container again. On my home server the first container contained mimron's head, the second container contained mail pvp ally only piece, and the 3rd container contained 3 blue pets. I take a wild guess, and say, someone killed Willy Wilder, who dropped his blood-soaked invitation, but the the killer already had one, and left it. Then the Panda lady came across, picked it up, and stuffed it in the box! Bought on Bleeding Hollow on 5/26/13 for the price of 33k. Contained 천하무적의 고삐. Which I would be 100% thrilled and squealing with joy about...except I already did a while ago. I've now got two of them. Oh well. For science! Confirmed rare mount drop. Got it for 55k in the end after an epic bid war, it contained 무쌍의 견갑. Cant believe it vendored for a whooping 4g 88s 30c so thats pretty sweet!.oh I guess I forgot to mention that I'm a priest. Panda Women says: Congratulations on your new box, may you find something of use in it! Deletedyou says: YES YES YES ! I'm going to get something so bad *ss! Deletedyou: BULL ****ing **** crap **** MOTHER ****ing 28g45s90c. ATLEAST I CAN PAY MY NEXT REPAIR BILL! And welcome back to Whats in the Box? The game show where we ask "WHATS IN THE BOX"
Ok contestent, you have made in to the final round and have a total of $100,000, now you can choose to take your money and go OR you can choose this mysterious box. What will it be? *Various Crowd Members chanting "Take the money" Or "The Box"
"You know what, Ill take the box"
And thats all the time we have for on Azeroths favourite game show... WHATS IN THE BOX? Can anyone confirm that it can drop several items? Even though it states in the text that you get "an item" it seems people been commenting that they acquired several pets from it. After you bought one of these, and opened it up. Be sure to upload your data to wowhead, and maybe we'll start to take the mystery out of the box. One thing I can say for this item... it should be made Bind To Account so if an item shows up in it that you could use on another of your toons you can send it over to them to be used as is or as a transmog. Might even make people continue to buy the set off the black market AH to complete it and having it continue to serve as a gold sink. I think that this is working as Blizzard intended; to help control the in-game economy by becoming a gold sink for those with too much money. To be honest, after having friends tell me horror stories of spending 30k for a piece of armor they can't use or a common pet they already own, I'm more apt to wait and bid on the actual items I want than spend the initial 5k to bid on this box. One particular theory I have been interested to hear more about is that the price could perhaps lead to a clue as to what exactly is in the box. Mounts for example normally have a starting bid of 20k, and mini pets/brawler invites can start anywhere from 1 to 5k. Although I can imagine this being slightly contradictory given the box is supposedly full of mystery, I wonder if anyone is able to confirm this or deem it untrue? On my server Sylvanas so far I myself have only seen 3 boxes, the first I wasn't quick enough to witness the starting price, the 2nd started at 5k and the 3rd started at 20k. Anyone able to give more info on this theory? It is @ 6,670 on my server. I bid for it. I won't spend much more than that. But hey, the Klaxxi mount is 7k and its a ground mount. Won it for 13k... Opened..
Gambling can pay of big! I won a container last night on US-Andorhal for roughly 33k… I went to mailbox and clicked to open it and BAM! 천하무적의 고삐 I actually did a double take because I was expecting some piece of T3 cloth gear for my DK. Dreams can come true. Whats in the box?...nooooo......whats in the bahhhhhhxxx? another one appeared on the BMAH today, which I also will be buying. Hopefully second time is the charm. You can easy know what is inside , because its not random item. Its hard to know but you can. If u come to BMAH every day at night, you can see which items are not sold, tomorrow or few days later you will notice this item(Unclaimed Black Market Container) in BMAH. inside will be this item. If u want to buy item is better to buy it when u know what will you buy because it will 100% cost less golds (because no one wont bit it :P) and people will bid box because they dont know what it is. Can this contain more than one item, or even nothing? Bought one on Zuljin for 47.5k last week, contained green proto drake. Well... Laugh it up. I deserve it. I knew the risks and tbh, it's not a big deal but the odds are SOOOOO against you here. I will not buy another box for more than like 5000g. It's a dumb risk. Good Luck to you if you try it. I check the blackmarket everyday on my low populated realm with nothing on, I saw one of these bad boys and was wondering what the hell it was, with my recent farming of dailies I've finally gathered a tasty sum of 10k gold, with literally no means of making money, other than farming dailies, it's considered quite a bit. One of these was on 6k gold, after doing a wowhead search I was drawn in instantly by the mounts - As are most people I imagine. I threw on a bid and I'm waiting for the results, I will post up what I got, when I get it! For now, wish me luck! so yeah....after repeat tries nothing worth much. Hello,This is the 1st time I saw this Box. 5k,And I went to bid 5,107g. 2. These can go up pretty high,and end up being crap. 4.If you don't want to waste your money,DO NOT try your luck. Unless it's those that are 1k-5k. 5. Do not expect it to be rare loot for it could be a 60 silver pet sold by an NPC. Will 'EDIT:' If I do recieve it. Good Luck too you all! Edit: Just got outbidded. Outbid was 12k. Oh well, better luck next time. Good Luck! One moment you're in the heat of a bidding war, the next you're out 70k with leather bracers... as a warrior. No need to call me retarded, I'm reminded every time I open my bag. We have all been at the point when we were noobs mindlessly buying every container and killing everything we can hoping that we will get a dragon mount. I just looted 역병 걸린 원시비룡 고삐 from my first 찾아가지 않은 암시장 상자. I almost fell out of my seat since I've wanted this mount since WotLK, but didn't complete the Nax achievements in time. Also, I didn't think I'd get a chance to buy it off the black market since it is so sought after and would likely be out of my price range on the black market (e.g. 천하무적의 고삐 went for a whopping 999,999g on my realm and that's for a farmable mount!). Wowhead is still collecting loot data, but if every item in the black market loot table has an equal drop chance (a guess at this point, but possible) the drop rate on any epic mount is probably extremely low. I wouldn't buy a container unless you are willing to lose some gold in the process and don't mind taking a gamble. Still, it can work out and it did this time! Good luck and best wishes! Since I had to reinstall windows and WoW forgot to reinstall Wowhead client to keep updates. In my first box which I payed 29k I got . Which payed of very nicely cause I'm ret paladin and this is my BiS neck. Second box I bought for 19k and got . Tryed to get other boxes but no luck cause they last past 22ST and they usualy spawn on my raid days ( guild raid time is 22:00 - 00:10 ST). I'll try to keep this updated and wowhead database to cause I re downloaded client. Glood luck to you all with boxes. Since I had to reinstall windows and WoW forgot to reinstall Wowhead client to keep updates so I'll leave it here what I got a week ago. In my first box which I payed 29k I got 성난 영혼의 부적. Which payed of very nicely cause I'm ret paladin and this is my BiS neck. Second box I bought for 19k and got 폭풍 기병대의 박차. I think this is bugged. I paid 17k for one and got leather gloves on my priest? Wtf..? its on youtube - the title is :- Unclaimed Black Market Container - Lets see what was inside! I just purchased my first 찾아가지 않은 암시장 상자 for just over 15k and received 분열자의 고리띠! Great luck for my first buy since I am a SV Hunter! If I was to bid on a chest, would I get something for my class.. ie mage so cloth (or ring for spellcasters etc) or could I get something totally useless, ie plate, mail etc, does anyone know? I have been really tempted to buy one of these as I have limited funds and can't purchase the mounts, when they rarely appear, as they go for near gold cap every time. However I been put of by the fact that the only thing I want from these boxes is mounts ,and I only need 9 of the 20 or so you can actually get from it.Which is an incredible low chance considering their are tons of other items that can be looted that I have no desire to spend 30-40k for. If you're gambling on this trying to make a profit, don't. Even if you get one of these for the opening bid of 5k, the most valuable loot (depending on the server) is probably worth about 5k. I'd only recomend this if you are a serious pet or mount collector, as there are some TCG mounts and companions you can loot from this. These would either cost you real world money or the off chance of somebody selling a code. Is that 100% drop change of a mount if i buy that box ? I bid on it when it was "short", which made this easy to win. So, if your going to bid...aim for when its near finished. I've also noticed as of late, most people on my server do not like to go above 15k. Just keep tabs on your server when it comes to these, and you should be able to obtain one in no time. Good luck to everyone else with their containers, and I hope you get a mount! I just noticed that 'Short' isn't always short overhere. While it should be and says, 'Less than 30 mins' it took one total hour instead, this time! I logged off when it started saying 'short' and logged-in again 5 minutes before the ending. 'Typically, the way that the auction house works is that each time there is a bid on the item, the duration of the auction increases. As the devilish little dwarf I am, ever since you have been able to purchase these container's I've been buying all the Blood-soaked Invitation's and keeping them in my mailbox. I'm still doing this and I'm not even sure they can be contained in the containers. The first I bought for 29k a few weeks back and contained 꿈나그네 장화. They were bought on a hunter, unfortunately. The second, which I bought last night, I bought for 45k. This one has allowed me to confirm that X-51 초강력 황천로켓 does indeed have a chance to come from the box as well. In addition to receiving X-51 초강력 황천로켓, there is something else I would like to point out. X-51 초강력 황천로켓 is one of the TCG mounts that can be posted on the AH. Despite receiving it through the BMAH instead of TCG, I would like to confirm that it is indeed still able to be posted on the AH should you choose to do so. The good news is, I bid 9350g, won, and got 푸른 비룡 고삐. By now you've figured out the bad news. They really have to make the box itself BoA otherwise there is literally no reason to buy it. If it was BoA you'd be able to peek inside, see the paladin or whatever gear inside, and then just mail it to your paladin, the item itself wouldn't be BoA or tradable in any way unless it was so from before. Unless you can farm gold like a pro, I don't really recommend feeding any gambling addictions here. These go for around 20k give or take on my server, and the odds of basically wasting thousands of gold is very high. The posts here are typical for ppl playing bingo, the slots, etc. We hear the good news, but there is little bad news, except about the amount of money ppl have spent, the amount of which is outrageous. People rarely tell you they got taken, but they will be happy to tell you when they won $500 bingo money, or a rocket extreme after spending $3k on bingo or 200k gold in Wow. The problem with Wowhead's percentages is that people who provide the data are self-reporting, they choose to submit their data and make remarks on line. So the data is not random, represents a small, specific pool of people, and is NOT representative of the population as a whole. Grats on winning, but I'll be damned if I spend a bunch of gold just to receive a mana wyrmling. So, I cancelled my sub about a week ago and had a bit of pre-paid playing time left so I thought, what the hell, blow all the cash on these things and see what I can get. First one cost me 7500g from which I pulled 천하무적의 고삐... 6 days of sub time left... way to reel me right back in blizz. Just bought one on US-Scarlet Crusade on my Hunter for 7.7k gold. Received 해골사신의 건틀릿. Ragemode engaged. So far on my low-pop server, I've opened about 10 of these boxes. Got a few argent tourney pets, the dalaran sewer rat, a few pvp pieces for the opposite faction(sigh), the Occulus mount I already had, and then I gave up for a few months. Last week a guildie of mine looted 역병 걸린 원시비룡 고삐 from the box, so I was kicking myself for not buying it. The next day I got 남풍 비룡 고삐, which surprisingly I hadn't had yet (from al'akir), so I guess it was worth the 10k. Just got a 2nd one. I am wondering if the amount paid for the box, has a direct link to what is inside? Is there a way to somehow obtain this item without buying it from the Black market itself? Because I don't feel like wasting 6k and get a rat (example) as my prize. So I'd thought I would just share MY experience with this item! Closed my eyes and crossed my fingers when I opened the container - and it contained.. Plagueheart Robe! Decided to go after another 찾아가지 않은 암시장 상자 tonight, after a long hiatus due to my last experience with one...one in which I payed 15k for a piece of armor I couldn't use, and was for horde side. It's a gamble, that's for sure! Tonight's container I payed 5,510g for it, and looted 북풍 비룡 고삐. On the bright side, it's not junk and its a mount. On the other hand, I already have it. However, I can confirm this mount drops from these containers. I hadn't seen it listed in the loot before. So, it's good to know other unlisted mounts can be in these containers. If only I could trade it to another player, because I'd gladly do so. Getting this mount has restored my faith in continuing gambling on these boxes, so it's not all bad. Good luck to everyone else! I got the frostfire shoulders out of it. Paid 6.6k. Considered my self very lucky. The t3 doesn't have class restricitions on them any more so i can put it on my warlock for transmog. I got a Smoldering Egg of Millagazor from one of these. Funny thing is I wanted to make sure I would have enough gold to bid on one of these if they showed up on the BMAH so I bought my first archives booster pack for kicks a few days ago hoping to get a spectral tiger. Well I did pull one and I got a spectral tiger to sell amazingly. The same night I bid on a container at 10:30 p.m. for 10k and wen't to bed not caring if I got outbid or not. I wake up the next morning to see that I actually won it and nearly shat my pants when I saw what was inside. As of Patch 5.4 I can confirm that the Unclaimed Black Market Container has a chance to contain Ashes of Al'ar. 8k for some redemption boots best 4g vendor gold my MAGE ever got. I got this Drake Of The South Wind Bad boy after i was fighting over a BMAH Box. went to 25k. got it and Closed eye, opened. AND BAM its was right there. was worth fighting for box. but last time i did box i got Tier 3 Chest Warlock. and i am a DK. If you were wondering, "What and/or Where is the Black Market Auction House?" See Wowhead's Guide to the Black Market Auction House. The new version of this item that was added in Patch 5.4 is 찾아가지 않은 암시장 상자. Does anyone know roughly how much this is worth and how much i should sell it for? I know prices change depending on server but this is a decent item. Please remove this, or amend it to something like , as it is no longer relevant. WHERE do I find/buy one? Something is up with these boxes, I bought one within the first month of MoP being released, and I got a heroic int ring, (I am a hunter) I was bummed and threw the unlooted box(ring still inside) in my bank, while cleaning my bank out today I opened it and looted it to vendor it(needed bag spot) it changed from an int ring to an Agility ring... one I could have used when I got it back in the beginning. so they might change if you don't loot it. or maybe now you only get gear you can use. Just wanted to share my first experience with this Unclaimed Black Market Container. So I read a lot about this container before even bidding on one at the BMAH. While I knew the odds were really against me, I still tried my luck and bid on one. I won it (luckily I'm on Lethon-US which is a medium populated server) for 7,7k gold. While I didn't expect to get anything valuable in it, I still hoped I'd get a mount. I opened it and I got Reins of the Drake of the North Wind. Yes I'm lucky as hell and yes the odds are now TRULY against me. No I won't bid on another Unclaimed Black Market Container for a while. Yes I'm super happy. Just keep in mind that you shouldn't expect to get anything valuable. If you have high expectations you'll end up disappointed but it's still worth a try. In my honest opinion you really shouldn't spend more than 10k for one container since the odds you'll get something you REALLY want are so low. I love the Proto Drake and have seen them go for over 350k on the BMAH so I like to think I'm currently ahead of the game after spending roughly 112k. Still grinding for 천하무적의 고삐 which is really what I'm after. The UBMC is indeed now unique. A screenshot and should be approved soon. Bought 2 so far, First one at 29,9k Gold contained a 알리스라조르의 화염갈퀴 and my second one at 69k Gold contained a 녹색 원시비룡 고삐 , hoping that one day something alittle bit more rare comes along, keep on gambling. Just opened the box as a 90 warrior. Paid a little above 20k for it. I assumed I got something neat. Related to me as a warrior, or maybe a mount of some sorts. Blizzard just busted my balls. I suspect most people, myself included, buy these boxes in the hope that it contains a cool mount like 미미론의 머리 or 천하무적의 고삐. So far I've bought two, one for 21,000G and one for 8,000G, which got me wondering if it would be better to just save my money and buy the mount I want, if it ever appears and I can get enough gold together, that is. Mounts like Mimiron's Head, Invincible's Reins would probably go for the gold cap (999,999G) so let's compare. You have a 0.7 percent chance to get these mounts from a box, which means that if you buy 10 boxes, your chance of getting the mount is 6.78 percent. At 25 boxes it's 16.11 percent, at 50 boxes it's 29.62 percent and so on. The break even point, so to speak, is 99 boxes. At 99 boxed your chance of getting the mount is 50.11 percent. That means that, on average, you'd need to buy 99 boxes to have just a 50 percent chance to receive the mount. However, random being exactly that, you could get it in the very first box or you might never get it, no matter how many you buy. If you are able to get every single container for 10,000G, which is doubtful if you're on a medium to high populated server, you're still going to spend 990,000G for a 50/50 chance, so in a purely financial regard it would probably be better to save your gold and bid the gold cap immediately if one of these mounts appear. However, I'll probably never gold cap so that point is moot. Besides, we all think that we'll be the lucky ones and beat the odds, so I'll probably keep buying these even though I shouldn't. Ok so, I bought 3 of these so far, and I don't think I'll ever buy one again. I bought one of these on the 5th of this month! I was totally expecting to get some junk, but I did win the RNG game and got a Mimirons head! So, I spent 21,000g on the container and ended up winning 18gold 19silver 13copper. It's the exact amount that a vendor will pay you for 고통을 부르는 검투사의 용감 소매장식 ... This purchase is going into my "Remember That One Time?" memory bank. don't spend 27k, you wait until there only worht 10k.. and besides.. it's worth it for the chance at many items no longer available in game. Can contain any of these items: wowhead link. Don't bother looking at the 'contains' tab. The sample is too small to be reliable. Received http://www.wowhead.com/item=113895&bonus=567 from one bought for 27.5k gold. I'll attempt to buy the next container on the BMAH (that I can afford, of course) and report back here with what I got. It'll probably be a piece of armor or something. But, if I get lucky, it'll be a mount! Fly to Telaari Station (Its a straight shot from your garrision) and use 아비아나의 깃털. While in the air, head straight north, holding the forward button or just auto-running. You will land right at the Ring of Trails and the Black Market is just to the left. So I fail to understand how one gets her hands on this box. Could someone enlighten me? 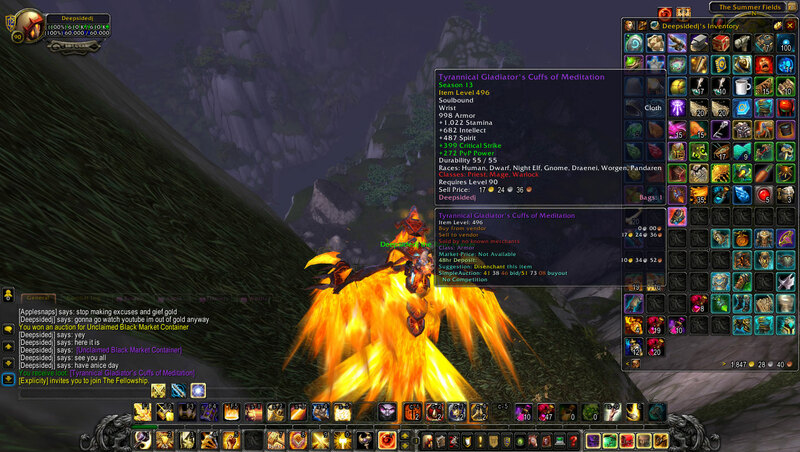 Just bought one in Gallywix for 12.6k and got a 서슬날 반지, mythic version. I bought two containers within two weeks. Today i bought another container for 50K and it contained Reins of the White Polar Bear, which was nice because i did not have that yet, I'm feeling quite lucky to have gotten mounts out of both the boxes, and i'll surely keep on buying these containers if my Wow wallet lets me. Bought two other containers for 50&40K, got Plagueheart bindings (cloth) on my warrior. Lol... and Picnic table. Got another one for 44K and it contained a Captured Firefly. Does anyone know how many items are included in this container? I decided to try my luck and bought one the other day for 11.5k. Expecting to get outbid I was pleasantly surprised when I found out that I had won and about had a heart attack when I opened it and was greeted by a 밀라가조르의 그을린 알.
I have bought this box 4 times now, 2 times I got a myhic ring for specs I didn't play. The third time I got a pvp ring for a spec I didn't play. So yeah.. keep bidding, you might get something awesome! Bought one of these today, for 51k. Opened it and got a 새끼 래즈자쉬 랩터. They sell currently for ~850g. One heck of a loss. Not sure these are really worth it unless you're farming one of the mounts or gear, AND you have an outstanding gold income. So far i've got 2 for around 20k each, First was some junk gladiator & the second was the tcg toy, flag of ownership. I've bought 3 of these since they were released. The last one was 10 minutes ago, and now my New Years Resolution is to stop buying these things. I paid 51k for 속삭인 약조의 목장식. On my warrior. Do not fall into the trap. You'd think that the Black Auction House would just open it and resell the item with no overhead. Based on what I'm reading here, I conclude that all the gear/items that drop are soulbound. Please leave a response if that is NOT the case, thanks. Just saw a bid today 960k on Stormscale-EU. You guys are worst then scratch-off people who take forever at the convenience store.... really sad. Bought my first BMAH container for 40k,... Got Son of Gallion mount! I am happy! This is definitely a -BUYERS BEWARE- item as it has the possibility to contain quite literally, all drop mounts, PvP gear, pets, tabards, unobtainable armour, TCG toys and some other bad/good items. The only reason that I'd suggest buying one of these is if you have a lot of gold, you aren't spending much gold, the box is much cheaper than usual on your realm or if you lost a bet! I bought one for 226k which despite how high it sounds, is outrageously low for my realm, Argent Dawn. For reference, almost all Unclaimed Black Market Containers on our server go between the price range of 300-500k gold. It was a bargain but obviously a massive gamble and although it is quite cheap in terms of the server average, 226k is still no little sum, even in today's money. I was lucky enough to get the Kor'kron Juggernaut from Garrosh Hellscream which as you can imagine, is huge success. Bare in mind though that just because I ended up getting an incredible deal, doesn't mean that you will. I also don't recommend buying these unless they are at a lower price range than the server average. -rogue main- i opened a BMAH container on my Warrior, because it was going cheap on that alts server so i thought why not throw a bid right? throw in a bid and go for a nap, log on to check how it went, surprisingly i won. open that bad boy up and got these fine shoulders, again, whom is a warrior. i will now PREACH that they make all T3 unlockable through any armor class characters until i die, wow dies or i quit wow. How can one bid on a very rare mount and forget to pick it up from the mailbox? Or is it just me being silly and thinking that the description of the container is true? Umm... How do i get one? Today I noticed an 찾아가지 않은 암시장 상자 quite cheap on my realm, which rarely happens and probably due to a lot of players doing the new patch content, so thought I would put a bid in - I promised I wouldn't spend more than 160k as I am frugal! I had to go offline, came back to find an 찾아가지 않은 암시장 상자 in my mailbox, I was so excited with it being my first ever box and getting it for a steal of a price (for my realm atleast). I knew chances were it would be junk, so I never got my I never got my hopes up. I clicked the little box and boom! Kor'kron Juggernaut popped up on rarity! Considering I had paid so little and I already have 320 odd mounts it could have been, not ashamed to say I screamed a little - having been grinding SoO since release for this mount, this was truly a wonderful moment. Fist box and couldnt be prouder with the results. In the last month I was able to buy 2 unclaimed containers,(can't bid during week since I'm at work when auction ends.) Well anyways I kept the 1st in my bank thinking I could collect a bank full then open all at once, sadly you can only hold one container at a time, so the 1st was a Mage t3 helm and the 2nd was Clutch of Ji-Kun mount. Anything over 100k, I walk away, so if you can, try to only bid if you know when auctions about to end, no sense of adding to the pot and eventually outbidding yourself. (side note as a warrior, and having no class restriction on t3 gear, you can wear all t3 sets. So I need to tell someone my story and I feel like this is probably the most accurate place to do so. Transferred to a new realm last week. Saw a Wooly White Rhino for sale for ~700k on the regular AH. Honestly this is pretty cheap IMO since most I've ever seen are going for 2-3m. So I buy it. Today I win a container on the BMAH for ~170k. Open it and OH LOOK A WOOLY WHITE RHINO! lol. I am not sure whether to be happy or sad...or slightly annoyed, lol. I mean I guess I should be happy considering the amount of people who just get vendor trash from these things, and the fact that I can probably eventually sell it for profit... but wow, lol. Like I would never be able to get that to happen again in a million years. "이전 경매에서 판매되었지만 낙찰자가 찾아가지 않은 물품입니다. 구매자는 조심하십시오."